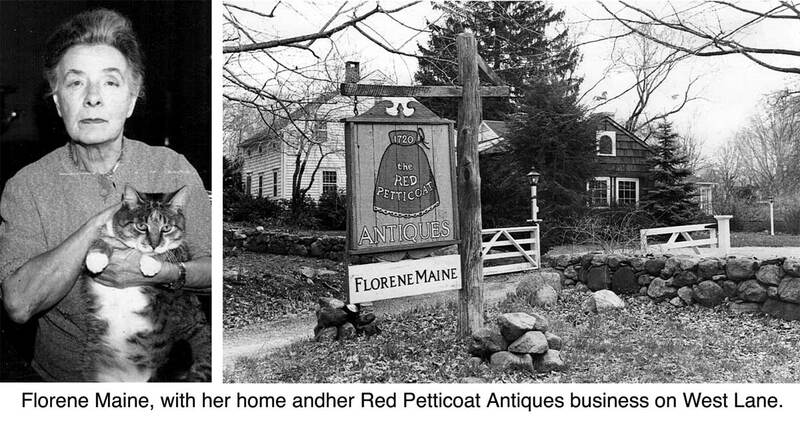 Few people in Ridgefield knew the value of antiques like Florene Maine. Born in 1896, she was a native of Indiana. Her mother and grandmother were involved in antiques, and with mom’s help, Florene Cansler sold her first antique at the age of 5 — a jewel box that had belonged to the Duchess de Orleans. The buyer, Kaiser Wilhelm II of Germany, paid 4,000 times what she had paid for it. She soon decided that antiques would be her profession. She married Bruno Jalmar Maine, art director of Radio City Music Hall, and came to Ridgefield in 1928, opening a shop on Route 7, and later in life, living and selling at Red Petticoat Antiques on West Lane. She eventually became one of New England’s leading antiques dealers, and lectured not only on antiques but early American history. She also had many notable clients. When Dean Rusk was secretary of state under Kennedy and Johnson, Mrs. Maine helped furnish the reception rooms in the Department of State. Her customers included Governor and Mrs. Nelson Rockefeller, musician Benny Goodman, actor Paul Newman, and Sara Ann Delano Roosevelt, mother of President Franklin Roosevelt. She retired in 1976 and died in 1980 at the age of 83.